After a whirlwind of visiting family and friends, unpacking and repacking, searching for, finding and buying a trailer, our time in Eureka had come to an end. We had a wonderful time. We soaked in the Redwoods, quality family time and of course tons of good food and Jitter Bean. There were so many people that we didn’t spend enough time with, we didn’t make it to see our friends in Crescent City, we didn’t make it to the snow, but it was time to leave. So on Sunday, January 2, 2010 we drove from Eureka, CA to Santa Rosa, CA where we made a pit stop for the night at our best friends. The next morning we woke up early to head to Family RV in San Jose, CA to pick up our new trailer. We arrived in San Jose about 9am and were hoping to be out of there by 12pm. We still had a 6 hour drive to where Nick was due at a meeting the next morning. Well as it usually happens, our tow vehicle need a little more work done to it to get it ready for towing. We spent the day hanging in our new home, watching movies and chatting with the folks at Family RV (sweetest people ever). I remember sitting on the couch in the trailer and thinking to myself, “this is my couch, that is my sink”. It felt so good to have a home again. I will admit that I was removing the dreaded wallpaper border and boxy valances in my head, however I thought it might be a little rude to start dismantling the trailer that I had just purchased. It must have been about 4pm when we finally left, 4pm in San Jose equals LOTS OF TRAFFIC! This was first time Nick had towed anything THAT big, a 30 foot long trailer. He pulled out of the parking lot, drove a few miles through San Jose (busy) and then got onto the freeway without a problem. If I was him I would have been an anxious mess, but he did wonderfully. About 5 miles down the highway Nick called me…he needed gas. We knew he needed gas and should have gotten it before we hooked up the 30 foot trailer, but we didn’t. He can only go 55mph, so I went ahead of him and got off at the next exit to make sure that the gas station would be hospitable to a long bed van towing a 30 foot trailer, thank God it was. After our gas stop we knew we would not make it to our destination, so I called up the Santa Maria, CA Wal-Mart to ask if they allowed RV’s to stay in their parking lot overnight, they did. We drove from San Jose to Santa Maria, only stopping one more time for dinner. We pulled into the parking lot of Wal-Mart at about 9pm, everyone hopped out of the van and into the trailer. The kids were asleep in seconds, I however was a little nervous; I had never slept in a parking lot. Well the next thing I knew it was 2am and Jericho was awake to eat, guess I wasn’t too nervous. The next day brought another early morning, Nick had to be at a meeting 2 hours away by 9am, so we headed out while it was still dark. What was wonderful was being able to watch the sunrise over the mountains between Santa Maria and Santa Barbara. I was so refreshed driving right along the ocean in between Carpinteria and Ventura, it is pure beauty. We arrived, Nick went to his meeting and we made breakfast and hung out in our new “home” (in the parking lot). We only have two little ones but we've been on the road for over two years in our RV traveling for my hubby's job. I just love it! Even though we have a home in Texas...really, THIS rv is our home. I love it and I love this life!! I am 'following' you now. 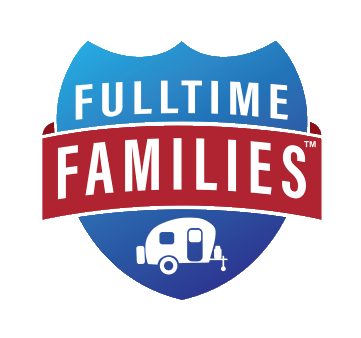 I hope you will stop by our blog and maybe we can get to know each other through our RV and homeschooling experience! I love your blog!! i have been looking for a bigger family that is on the road. i would love to see pics of your TT and hear how you get everyone about. do you all ride in the van and the van pulls the TT? can't wait for more posts! !